Schooled by sisters in habits, they began their own careers as educators when high-tech meant a ditto machine and an overhead projector. Now principals, they oversee institutions where the typical third-grader packs more computing power than the Saturn V rocket that launched the Apollo space program. Mrs. Smith was a college student in 1969, when man first walked on the moon. In 1972, multitasking meant teaching every subject to her fifth-grade class at a parish school in New Jersey, where the students were likely to be Little League teammates and attend the same Sunday Mass. Today, she oversees a student body of 600 that draws from eight Frederick County parishes and the Catholic community of Fort Detrick; approves a fundraising committee that helps keep parishioner tuition less than $6,000; directs a staff of 60; monitors rising energy costs; and referees the escalating debate that pits textbooks against technology. Mrs. Smith has a rare perspective on that issue, as in 2000 her husband’s career brought them to the technology corridor along Interstate 270, which links Frederick to the Capital Beltway. Her master’s degree includes a concentration in learning technology. When Mrs. Smith was a schoolgirl, acting up might have meant a spitball flung to a chalkboard. Today, she has her antenna up for cyber-bullying and plagiarism, which is as easy as cut and paste. If information has become easier to access, so have educators, by helicopter parents. The two are forming a support group for principals. Like Mrs. Murphy, Mrs. Smith was educated in a parish school, when tuition wasn’t an issue because religious orders, like the School Sisters of Notre Dame, handled classroom instruction. 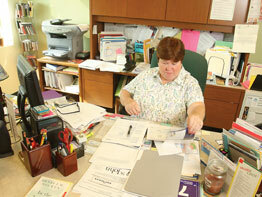 Mrs. Smith oversees a facility that opened in 2006. The curriculum includes a chemistry lab, and religion, daily from pre-kindergarten to eighth grade. Nonetheless, that’s not as easy to integrate into the curriculum as it was in the 1960s. Her summer reading included “It’s a Catholic School … Let’s Keep It Catholic,” by Edward William Quinn.